My first taste of a Black Bottom Cupcake was at an an Easter Egg Hunt in 1978. It certainly made an impact, and I remember searching for the recipe and making it for my teachers. Things haven’t changed much because I’m still making Black Bottom Cupcakes for teachers! And one thing I’ve learned is that I have to include the recipe because people almost always ask for it. Anyhow, over the weekend I was brainstorming treats for a 400 person event and thinking the original Black Bottom Cupcake recipe would be too time consuming for too few cups. Making a miniaturized version seemed like a good idea, and thus Mini Black Bottom Cupcakes were born. 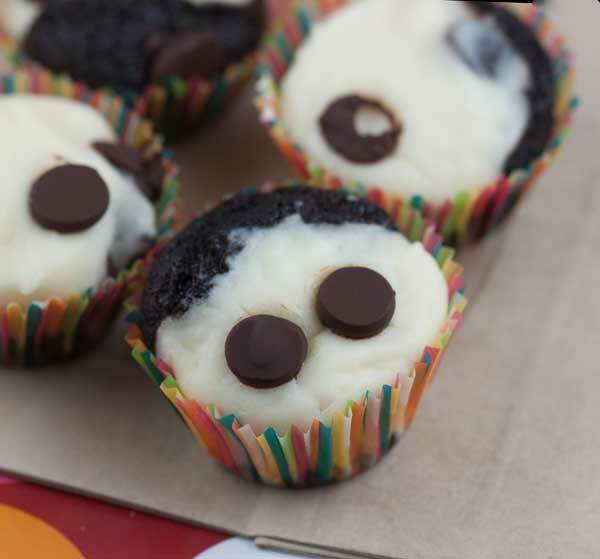 This recipe will give you over 40 Mini Black Bottom Cupcakes. 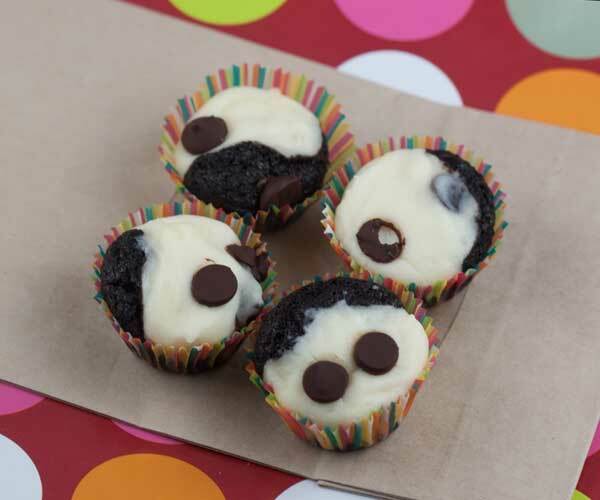 Mini Black Bottom Cupcakes are a miniature version chocolate and cream cheese filled cupcakes also known as Black Bottom Cupcakes or Cream Cheese Brownie Cupcakes. Preheat oven to 325 degrees F. and line about 42 miniature muffin cups with paper liners. Filling: Beat the cream cheese, sugar and salt until smooth. Add the egg white and beat on low speed just until mixed; stir in the sour cream, vanilla and chocolate chips. Set aside. Cake: In a mixing bowl, beat together the oil, sugar and vanilla. Mix the flour, cocoa powder, baking soda and salt together in a small bowl. Add the buttermilk and flour alternately to the sugar mixture, stirring until smooth. Stir in the chocolate chips. Using about a teaspoon measure, drop chocolate mixture into the muffin tins dividing evenly. You should still have a lot of room left in the muffin cups at this point. Using a heaping half teaspoon (about 1 level), spoon cream cheese batter over the chocolate batter. The cups should be about 2/3 full, so don’t go strictly by the spoon measurements, but rather how full the cups are. The cupcakes need room to rise. Bake on center rack for about 15 to 17 minutes or until tops appear set. Let cool in pans for about 10 minutes, then carefully remove cups from pans and let cool completely. Chill before serving. The measurements given for the amount of batter in each cup are approximate and may vary by interpretation. The key is to not overfill the cupcake cups so that there's room for the cheesecake topping to rise. On the flip side, you don't want to underfill them because they're cuter with slightly rounded tops. I think I love all versions of these, Anna! When we were living/working in Greece(’58 -’66) I often was able to pick up GOOD HOUSEKEEPING MAGAZINE. GH had a monthly ‘SusanCooks’ – a teenager – and the recipes were fun to read — I don’t have that clipping any more so have NO idea what the year was .. but it was Black Bottom Cupcakes. When we returned to U.S. and interest in cooking contests grew, I traded with friends for PILLSBURY BAKE OFF books — imagine my surprise when I found one from the 13th PBO – 1971…and one of the 1st prize sr. winners was BLACK BOTTOM CUPS. I was always curious as to WHEN (what year) I’d seen the recipe in GH — but that clipping was lost in many of our moves. I still make versions .. but often the ‘bar’ type. I think someone had a version at PBO (bar type) sometime in he ’70’s or 80’s. And they’re ALL still good .. tho agree I like the minis — if not bars. Never mind- I see where you added them in….my bad! Do you put the chocolate chips on before or after baking? 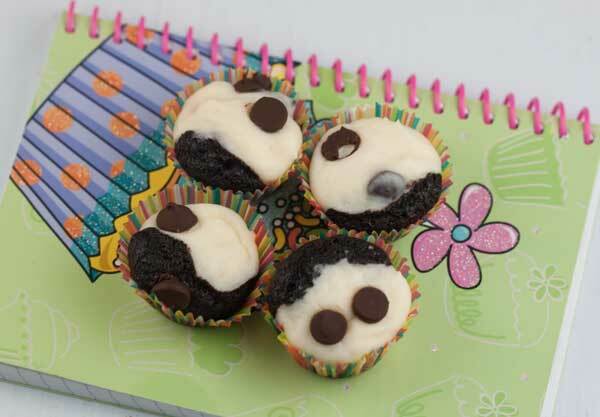 I just made another recipe leaving me with an egg white to spare- I may have to make these! I haven’t made those cupcakes in years… but they’re always so good! Love the photo on the spiral-bound notebook! The cream cheese filling stayed beautifully white. Lucky people who get to taste these.